The Council on American-Islamic Relations (CAIR), the nation's largest Muslim civil rights and advocacy organization, today offered a $5,000 reward for information leading to the arrest and conviction of the perpetrator of a deadly attack on a Saudi Arabian student in Wisconsin. CAIR said University of Wisconsin-Stout student Hussain Saeed Alnahdi, 24, died one day after being assaulted on a street in downtown Menomonie, Wis. The attacker, described as a white male about 6 feet tall, assaulted Alnahdi early Sunday morning near a pizza restaurant. Alnahdi was found unconscious and bleeding from his mouth and nose. He was hospitalized and later died from his injuries. CAIR's Minnesota chapter (CAIR-MN) and its national civil rights department are both monitoring the case. CAIR-MN Executive Director Jaylani Hussein is meeting today with students and staff at the University of Wisconsin-Stout. (MINNEAPOLIS, MN, 10/18/2016) - The Minnesota chapter of the Council on American-Islamic Relations (CAIR-MN) today called on administrators of Bagley High Schoo lin Bagley, Minn., to cancel an event this evening featuring notorious Islamophobe and anti-Muslim conspiracy theorist John Guandolo. The Southern Poverty Law Center (SPLC), an organization that tracks hate groups in America, describes Guandolo as "a disreputable character, who regularly attacks the U.S. government, claims that the director of the Central Intelligence Agency is a secret Muslim agent for the Saudi government and says that American Muslims 'do not have a First Amendment right to do anything.'" "Islamophobes like John Guandolo have the right to spew their misinformation and bigotry, but they don't have the right to do it using a taxpayer-funded academic institution as a platform," said CAIR-MN Executive Director Jaylani Hussein. "The perception that the high school may be endorsing Guandolo's anti-Muslim bigotry could lead to a hostile learning environment for Muslim and other minority students." He suggested that high school administrators tell Guandolo to find a private venue for his talk. (Minneapolis, MN, 10/17/16) - The Minnesota chapter of the Council on American-Islamic Relations (CAIR-MN) today joined the Minneapolis NAACP in calling for an independent investigate of an incident in which an African-American man was arrested for walking in the street because a sidewalk was under construction. 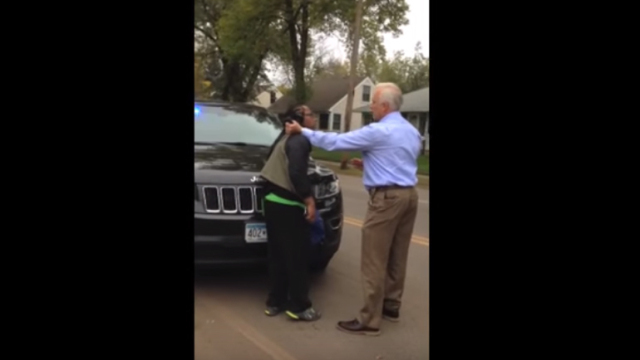 Cell phone video of the arrest by a white police officer in Edina, Minn., has drawn widespread outrage. The woman who captured the incident on video said, "There was absolutely no reason for the officer to stop him from walking." "We believe this humiliating incident would not have occurred had the individual targeted by the officer been white," said CAIR-MN Executive Director Jaylani Hussein. "This is an apparent case of 'walking while black' that should be investigated by an independent body." MINNEAPOLIS, MN, 9/18/2016) – The Minnesota chapter of the Council on American-Islamic Relations (CAIR-MN) today joined Muslim community leaders at a press conference in St. Cloud, Minn., to respond to the Cross Road Mall stabbings. (MINNEAPOLIS, MN, 9/7/2016) - The Minnesota chapter of the Council on American-Islamic Relations (CAIR-MN) today welcomed a federal charge brought against a man who allegedly threatened to blow up a mosque in that state last year. United States Attorney Andrew M. Luger announced today that a federal criminal complaint was brought against Daniel George Fisher, 57, for allegedly threatening to blow up the Tawfiq Islamic Center in Minneapolis, Minn. Fisher appeared today in U.S. District Court in Saint Paul, Minn. He was charged with one count of "Obstruction of Persons in the Free Exercise of Religious Beliefs." The Tawfiq Islamic Center reportedly received an anonymous handwritten letter threatening to "blow up your building with all you immigrants in it." The letter also included "profanities, racial and ethnic slurs, and other derogatory commentary about the religious and cultural practices of the members of the Tawfiq Islamic Center." The FBI interviewed Fisher in June. He reportedly told the agents that he had become "increasingly angry with Muslims since 9/11." "We welcome the federal charge brought in the case and hope that the prosecution of this individual will send the message that threats targeting religious minorities will not be tolerated," said CAIR-MN Executive Director Jaylani Hussein.